I am not one to pass up free food. My favorite grocery store, Wegmans sent me a coupon to try their gluten-free vanilla cake mix – so I took a box home. If I did not have access to Wegmans brand I would substitute the Betty Crocker gluten-free version of vanilla cake mix. The addition of almond flour breaks up the tender crumb and gives it more texture. As with many gluten-free mixes they are just the dry ingredients – so they are a big timesaver but still have a great home-baked taste. The raw sugar sprinkled on top gives a nice crunch. It took minutes to prepare and get into the oven and a very nice treat with my morning cup of coffee. 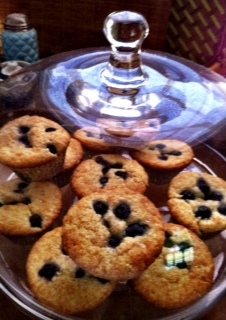 This entry was posted in Recipes and tagged Almond flour, Blueberries, dessert, Gluten-Free, Gluten-Free Cake Mix, Muffins. Bookmark the permalink.